Shaving bowls are not the most complicated products. There aren’t hidden features that you should take into account when choosing the best shaving bowl. There are only few aspects that you should consider. You should definitely take the depth of the bowl into account. It should be able to hold the lather while you’re preparing it with your brush. You should also consider the width, if you use shaving soap. Go for a bowl wide enough to fit the soap. And last but not least, choose a model that will compliment your bathroom. Basically, we recommend you fit your shaving bowl to the rest of your shaving equipment. If you have, for example, a bigger brush and soap, then you should choose a bowl deep and wide enough to fit into the equation. You can also go for a bowl that fits well with your safety razor. Whichever will be the deciding factor for you, make sure to choose a bowl that best fits your personal style of shaving. Below you will find our selection of shaving bowls, to help you easier find the one that best fits your preferences. Edwin Jagger is another big name among quality shaving gear. This could possibly be the best shaving bowl, according to our taste. It looks exactly as presented in the product pictures, which is something amazing. Generally, products look a bit different in real life than in the picture on the box. This shaving bowl makes an exception, and what a great one! It’s deep enough to fit a 2.25 oz. shaving soap on the bottom, if you wish. But we recommend you don’t put a soap on the bottom because it’s specially designed to make a richer lather. On the bottom of this bowl you will discover 3 bumps that, as you will probably notice as well, will help you make a better lather with less effort. 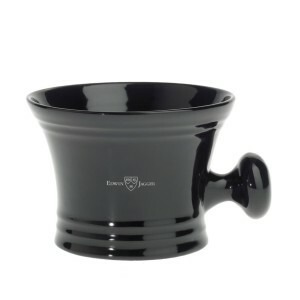 This mug is made of black porcelain, which looks extremely well and of high quality. It will probably look amazing in your bathroom. You have to pay attention, though, because in the case you drop it, you won’t have a complete bowl after that. In an intention to decrease the chances of slipping from your hand, on the side, it has a handle, which is a well thought out addition. You can hold and use it easier, so you can focus on what’s important. Another nice aspect of this bowl is the wide opening on top. It’s so much more comfortable to make the lather. Col. Conk shaving products are exceptional. We think they have useful, interesting and high quality products, and this shaving bowl doesn’t make an exception. Each one of the Colonel Conk Model 111 Shave Cups is handcrafted in New Mexico, being individually glazed. Because of this, each cup will vary in colors and will be unique. If you had prior experience with Col. Conk, then you probably share our opinion. If you never had any contact with the brand, you will discover that they offer a good value for money rapport. 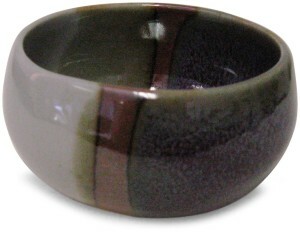 The great thing about this bowl is the fact that every item is handcrafted and individually glazed, making each bowl unique. The colors match with different types of shaving products. It’s made of ceramic, which is as much an advantage as a disadvantage. Of course, it’s easily breakable compared to other materials, but it also holds its temperature fairly constant. It’s not as deep as other shaving bowls that we’ve included in our list, but this might be a plus given the fact that it’s made of ceramic. You could damage it with your shaving brush while making the lather if it were too deep. In this case, the lack of great depth is an intelligent decision on the part of the designers of this item. All in all, a great choice to complete your shaving gear, and a helpful tool to make your daily routine not only easier but far more stylish. 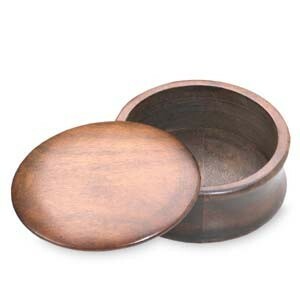 This dark wood shaving bowl is a true eye-catcher. The first thing that we noticed was the lid, a feature most shaving bowls don’t have. This is an extraordinary advantage if you have a shaving soap. Your soap will be safely contained inside the bowl and it will not dry out and crack. The lid is a simple, smart addition that adds a lot of value. It has good dimensions, big enough to fit a shaving puck and deep enough to comfortably use it with your shaving brush. The dark wood is a tasteful choice for a material. It looks great, but has some slight disadvantages. You shouldn’t soak it too often, as you might discover some problems with your bowl degrading sooner than expected. It might present some disadvantages for those who just started wet shaving. Overall it’s a very good choice for a shaving bowl. Previous post: Which is the Best Shaving Brush?